What are the most memorable football games ever played? It isn’t any particular Super Bowl or even what many call, “The Greatest Game,” the 1958 NFL Championship between the Baltimore Colts vs. the New York Giants. In fact, it doesn’t even concern pro football. It does not involve any particular play or series of plays, or any particular star athletes for that matter. It transcends all of that and instead encompasses an era of college football during this country’s and the world’s darkest hours. The contestants of this legendary rivalry fought fiercely on the field of play. Many of those same players would, within months, fight as fiercely and many would die with honor on the battlefields of World War II. 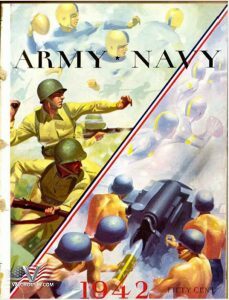 The gridiron battles between Army and Navy in the years 1941 through 1945 were some of the most unusual ever played. Although they were technically just two college football teams, the entire nation was involved. Everyone in American was in uniform or had a family member or friend in the uniform of one branch of service or the other. The games were broadcast, by radio, into every home, barracks, berth, and foxhole from Europe to the Pacific. The sacrifices and events surrounding these games have never been equaled. The play by play accounts of the game action was as eagerly anticipated as the latest war news. The first thing the new coach accomplished was to almost lose his team. Blaik worked the team hard, even by army standards. Both physically and at fundamentals, he drove them to the point of exhaustion. Many players began to consider just plain quitting. Despite the grumbling, the Cadets responded and finally had a winning season. And although Navy beat Army again that fall (this time 14-6) it was at least competitive and the 102,000 fans that saw the game at Philadelphia’s Municipal Stadium were thrilled. Most had arrived by train, coming from all parts of the country and the Pennsylvania Railroad had to add 38 more trains than normal to handle the extra passengers. This was the last peacetime game until 1945. Incidentally, in the official game program, there was a color photo of the battleship Arizona, with the caption, “no battleship has ever been sunk by a bomb.” It was the day after Thanksgiving and just a week later the world would be changed forever with The Arizona lying at the bottom of Honolulu Bay, a victim of bombs dropped by the Japanese at Pearl Harbor. The plans for the 1942 game were, to put it mildly, surreal. First, there was a debate in Congress as to whether the game should be played at all. There was a precedent. The Army-Navy games were canceled in 1917 and 1918 due to World War I. But President Franklin D. Roosevelt prevailed. He felt it was important for the morale of not only the Cadets and Midshipmen but for the country at large, to have the game go on. Still, there were obstacles to overcome. The nation was indeed on a war footing and all kinds of items were being rationed, including gasoline. So, it was decided that the game would not be held at a large stadium, as they had been in past years. This game would be played at Thompson Field in Annapolis, Maryland. That would cut down on the crowds. It was additionally decided that those not living within a 10-mile radius of the stadium would not be allowed to come. The only exceptions were to naval academy employees, girlfriends of midshipmen, and the 210 accredited members of the press. Even Navy’s players had to apply to be at the game. Incredibly, Eleanor Roosevelt, wife of the President, wasn’t allowed to attend because she lived too far away – in the White House. Finally, it was decided that the Corps of Cadets at West Point couldn’t attend. Who would be left to cheer for the Army? The answer was the Navy! Orders came down that the third and fourth-year Midshipmen were to sit behind the Army bench and cheer for that team. This even involved two of the Navy cheerleaders traveling to West Point to learn the Army cheers and songs. So, on the afternoon of November 28, 1942, only 11,700 showed up to watch the game, the smallest crowd to ever see an Army-Navy game since 1893. As to the action on the field, it was violent. With the pressure, excitement, and dangers of the war, the tension was at a breaking point. Steam had to be let off and it was! There were crushing hits, outright punches to the jaw, and tripping and kicking at every chance. At one-point time-out was called so one of Army’s players could try and find his missing teeth in the grass. It was raw football. Again, Army played its heart out, but Navy won 14-0. Beginning with the 1943 season the players for both West Point and Annapolis had to do their best to represent their schools on the football field while cramming four years of military education into three. The United States urgently needed the young midshipmen and cadets as combat officers. Along the Hudson and the Severn Rivers, word started to drift back about their classmates who had already graduated, many having fallen in battle. Being a second lieutenant was not considered a long-lived occupation. A sense of intensity permeated everything the Cadets and Midshipmen did. Football was no exception. In 1943 the game was moved to Michie Field at West Point. Army put up another heroic effort, but Navy again won 13-0. The Cadets were not despondent, however, because everyone could clearly see that Army was becoming a pretty good football team. In their third year under head coach Red Blaik, the Cadets compiled a 7–2–1 record. Their stalwart defense shut out five of their ten opponents, and their hard-running offense outscored all opponents by a combined total of 299 to 66. 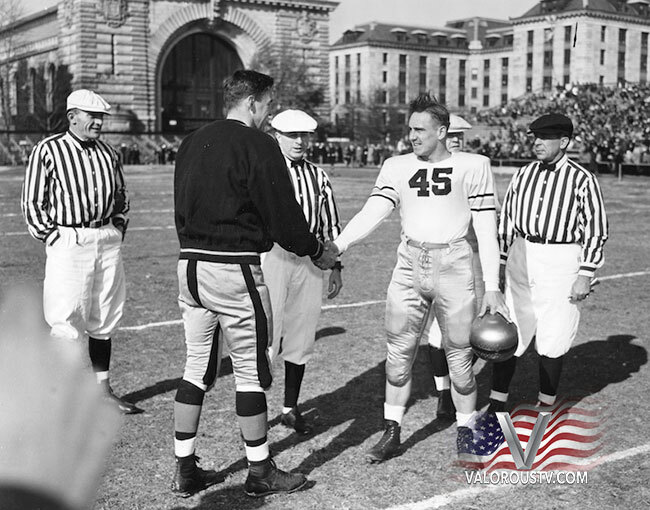 As the days ticked down in 1944 for the 46th edition of the Army vs. Navy annual gridiron engagement, the success of the two squads that season had propelled public interest to a fever pitch unparalleled in the series. Breathless media declared the matchup of the No. 1 Cadets and the No. 2 Midshipmen the de facto national championship, and the interest of the public at large seemed to cement that sentiment. It proved to be the rare case in which the contest completely lived up to the hype. The 1944 season had unfolded with an inescapable backdrop of the United States at war. The Normandy invasion had taken place on June 6, and the entire country had been transfixed by the ongoing battles to reclaim Europe from the grip of Nazi Germany. That same month, the Battle of the Philippine Sea had marked one of the most decisive victories by the Allies against the Japanese navy in the Pacific theater. Yet as December began, the national mood had become more resigned. Setbacks in Europe and the bloody, unending battles to take obscure Pacific islands had dampened the summer’s optimism that the conflict was nearing its conclusion. On the home front, football was a respite from the grim news from overseas, and the service academies were the shining stars. 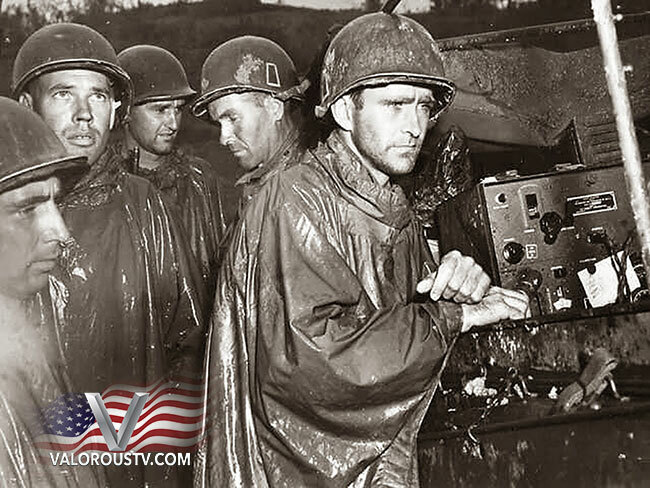 In fact, Army was becoming so good that it was ranked #1 in the nation in 1944. Navy was ranked #2. What a match up! But because of travel and rationing concerns, Congress again argued over having an Army-Navy game. Then House Minority Leader William Martin came up with a brilliant idea. Since interest in the game was at a fever pitch, why not use it to raise money for the war effort. So, the December 2 game was moved to Baltimore’s Memorial Stadium. Tickets to the game became the most expensive in history, ranging from $25 to more than $1000. And this was 1944! Before a fan could purchase a ticket, he had to show proof that he also purchased a war bond for each seat. Fifteen private boxes on the 50-yard line sold for $1-million each. In the end, with more than 100,000 people in attendance, the game raised $58-million. This was to be the only time in history that a college football game was a fundraiser for a nation. Getting to the game was another story. Because the rail system was jammed with troop movements, the Corps of Cadets had to travel to Baltimore by steamer, escorted by Navy destroyers in case a German sub tried to torpedo them. As they traveled down the Atlantic Seaboard the seas became rough and most got seasick. The Cadets were finally glad to eventually come back to land. The players recovered in time for the game. Blaik’s pregame speech to his Army team consisted of reading a telegram sent from General Robert Eichelberger, who had been superintendent of West Point two years prior but was then serving in the South Pacific. 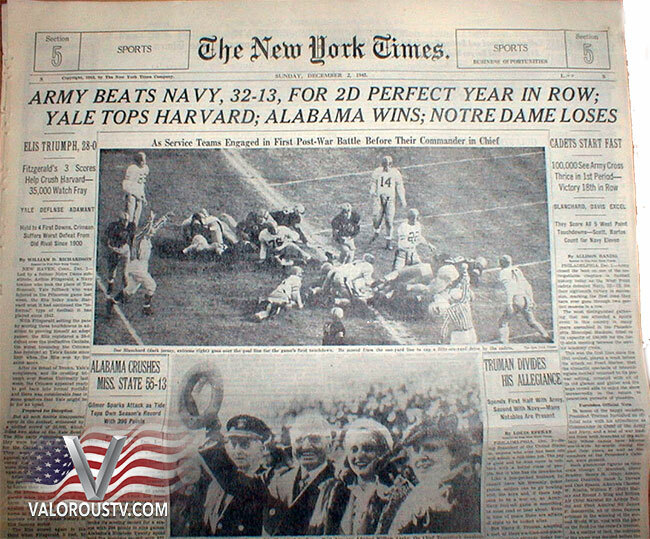 It concluded, “Win for all the soldiers scattered throughout the world.” This time it was the Navy who gave it their all, but Army finally won the big one 23-7 and became National Champs, the first time they had done so since 1914. 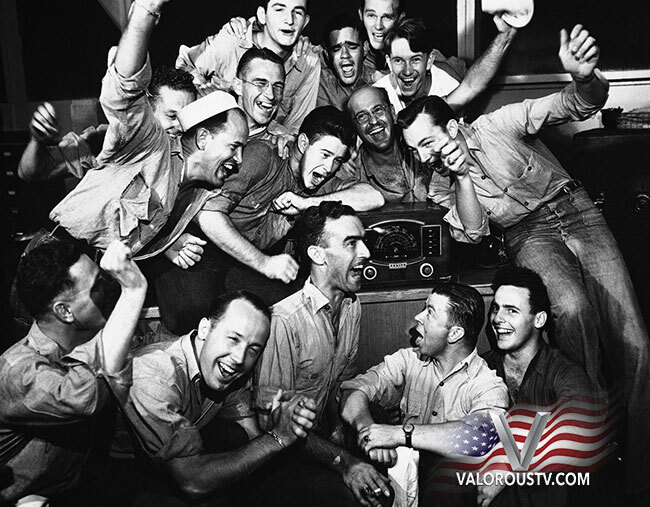 The next year the game was played with wild jubilation because just a few months earlier the war had ended, and the victorious Americans were in a celebrating mood. The 1945 game was moved back to a large venue, this time back to Philadelphia’s Municipal Stadium with it’s 100,000 plus seating capacity. 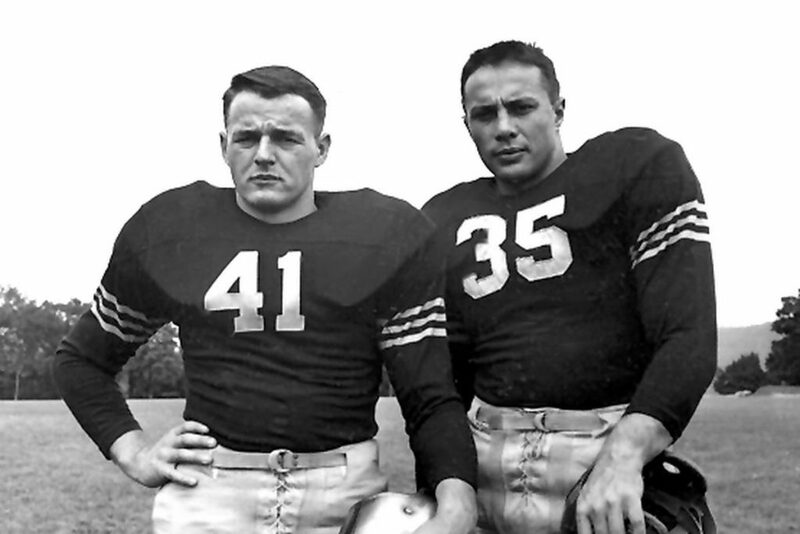 Army again was #1 in the nation, not having lost a single game in two seasons, with two Heisman Trophy winners in its backfield, namely Doc Blanchard and Glenn Davis. In fact, for the only time in college football history, an entire team was selected as All Americans! Army deservedly won the game 32-13. But that was just what happened on the field. President Harry S. Truman was there and brought the entire Cabinet with him, along with a huge entourage of war heroes including Generals George C. Marshall, Omar Bradley, Jimmy Doolittle, and Admirals Chester Nimitz and William (Bull) Halsey, to name a few. Never has a game seen so much “top brass” in any one place. And NBC, for the first time, televised a sporting event from one city (Philadelphia) to another (New York). The accomplishments and sacrifices during these incredible years will never be repeated. College football will continue to have many great days, but nothing will ever equal the unique times that existed during the World War II years, particularly as they affected two small, exceptional schools located at West Point, New York, and Annapolis, Maryland.